Save up to 90% with Tuango! Everyday, Tuango offers deals on shows, getaways, spas, restaurants, activities and more! Please contact us HERE and it will be our pleasure to assist you. Thomas Rhett's show at the Bell Center on April 24th! The perfect blanket, especially with the cooler days ahead! Winter print, soft texture and comfortable material, this throw will have you fall under its soft spell for the months to come! 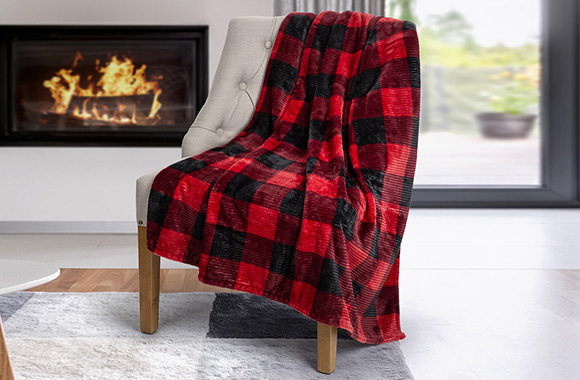 To snuggle on the couch during cool evenings or curl up in front of the TV, this blanket will be your best ally all year long. With the Tuango Boutique, we invite you to discover a great selection of products that have inspired us. All the products have been carefully selected and are available at amazing prices for a limited time. In addition, we guarantee that each featured product is authentic and comes directly from the manufacturer, a licensed agent, retailer or importer. Subscribe and get an extra 10% off your first purchase! *By subscribing, I accept the Terms of Service of the site and to receive the Tuango emails. I know that I can change my preferences or unsubscribe at any time. Tuango Inc. 450 Sainte-Hélène, Montreal, Québec, H2Y 2L2. Customer Service: 514-282-0288. Sorry! This deal has expired. Don't miss out the next time it comes around! I also want to subscribe to the Tuango newsletters to be notified of other deals in my area and beyond. You can unsubscribe or change your email preferences at any time. We'll keep you posted when a new deal from this seller arrives. Thank you for using Tuango site.